GE has been in business since 1907. They have dedicated their company to customer service and high quality products. Millions of homes all around the world have GE products in their homes. This includes Stoves, Refrigerators, Washers and Dishwashers. Most homes these days are equipped with a dishwasher. Back about 5 years ago, people were hesitant to use their dishwashers because they saw increases in water bills and energy bills. But the dishwashers today are more energy efficient and the Energy Star Rating System has certified them. Today, dishwashers allow you to save time, space and money. One of the best styles of dishwashers is the Convertible/Portable Dishwashers. These are becoming more popular over time. 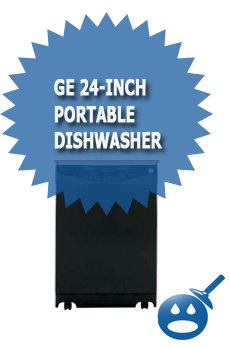 One of the best in the GE inventory is the GE 24-Inch Convertible/Portable Dishwasher Energy Star. This dishwasher is Energy Star Rated, meaning that you will save money on both water and the energy bills. Let’s take a look at the specifications and the benefits of this GE dishwasher. 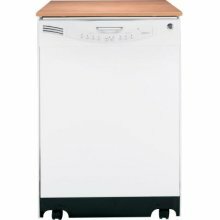 The specifications of the GE 24-Inch Convertible/Portable Dishwasher Energy Star are the dishwasher is electrically rated for 120 Volts with 60 Hz. The full load amperage is 6.2 with a heater with a maximum wattage of 500. Some of the other specifications are the Pots and Pan Cycle; this cycle will actually help scour off any hard to remove foods that get stuck on pots and pans. The GE 24-Inch Convertible/Portable Dishwasher Energy Star offers a 100% water Filtration that has an Extra Fine. This filter clean water will help keep dishes clean and free from bacteria. One problem that many dishwasher owners have is the pool of food that often gets stuck at the bottom of the dishwasher. With this dishwasher you will receive the Piranha Hard Food Disposer. This device helps grind down the left over food that is often left on plates, pots and pans. This disposer will help grind the food so small that it will wash away. No more mushy food at the bottom of the dishwasher. This dishwasher has 3 different dishwasher settings, the HotStart, Heated Dry On/Off and the Hi-Temp Wash. This dishwasher is equipped with the QuietPower I and the QuietPower Motor. Some of the benefits of the GE 24-Inch Convertible/Portable Dishwasher Energy Star is that it comes with GE’s TouchTap Controls. With this control system it makes setting and adjusting the controls easy as 1-2-3. This dishwasher has a Candlelight WoodGrain Laminate Top. This surface can used as a great food prep place or a great place to stack your dishes while you are loading the dishwasher. 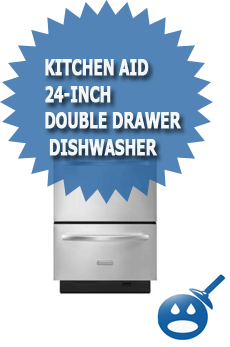 The GE 24-Inch Convertible/Portable Dishwasher Energy Star has a 4Level PowerScrub Wash System. This system has accurate water jets and hot water temperatures to take away hard to remove food stains. GE offers a Deluxe Silverware Basket. This new basket offers a fitting space with the capacity to effectively clean the silverware. The Energy Guide to Model GSC3500NWW states that when you use this dishwasher with an electric water heater your yearly operating cost is about $30.00. If you have a natural gas water heater then your operating cost could be about $19.00 a year. The estimated kWh is about 281; these costs may vary due to your own utility costs. If you are looking to accessorize your dishwasher with your kitchen, the GE 24-Inch Convertible/Portable Dishwasher Energy Star is available in Black and the Model Number is GSC3500NBB. GE is most known for the durability of their products. Everything they do from air conditioners to dishwashers are made with quality components and great ideas. GE is one of the most popular appliance companies in the world. GE offers a one year limited warranty on parts and labor. There are extended warranties available for additional costs. The GE 24-Inch Convertible/Portable Dish washer Energy Star is great for kitchens that aren’t equipped with dishwashers. The unit is compact and will look great in any kitchen. There are dual filtration units in this washer. The dispenser is a Rinse Aid with Indicator. Everything you need and more is in this dishwasher. Do some research and see how the GE 24-Inch Convertible/Portable Dishwasher Energy Star stands up against other brands. The GE 24-Inch is reasonably priced at $448.00 and you can find them at your local Lowe’s Home Improvement stores.